Also known as AAMI Park, Melbourne Rectangular Stadium is unique as far as stadiums go. With an innovative bioframe geodesic roof and a range of sustainability features to boot, this multi-award-winning building is worth a closer look. Where is AAMI Park/Melbourne Rectangular Stadium? The stadium was built on Edwin Flack Field, which is located about 1km east of the CBD, between the Yarra River and the MCG. Designed by Cox Architecture and completed in 2010, the stadium spans 55,480sqm with a capacity of 30,050 and a total cost of $267.5 million. It features a cutting-edge bioframe design with a geodesic dome roof which substantially covers the seating area. The roof’s unique design meant it was able to be built with 50 percent less steel than a typical stadium roof of the same size, which is quite an achievement. Another interesting feature of the stadium is its lack of support structures, which enables spectators to have completely unobstructed views. 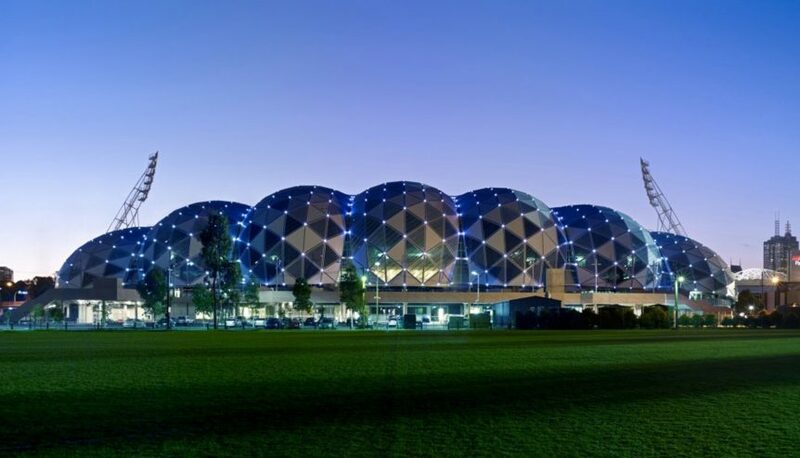 The bioframe roof designed for Melbourne Rectangular Stadium is a lightweight steel design based on the Buckminster Fuller geodesic dome. Its triangular panelised façade is made up of a combination of glass, metal, louvres and solar panels, with the ability to collect rainwater. This striking combination of engineering and design makes the roof unique within Australia and the world.